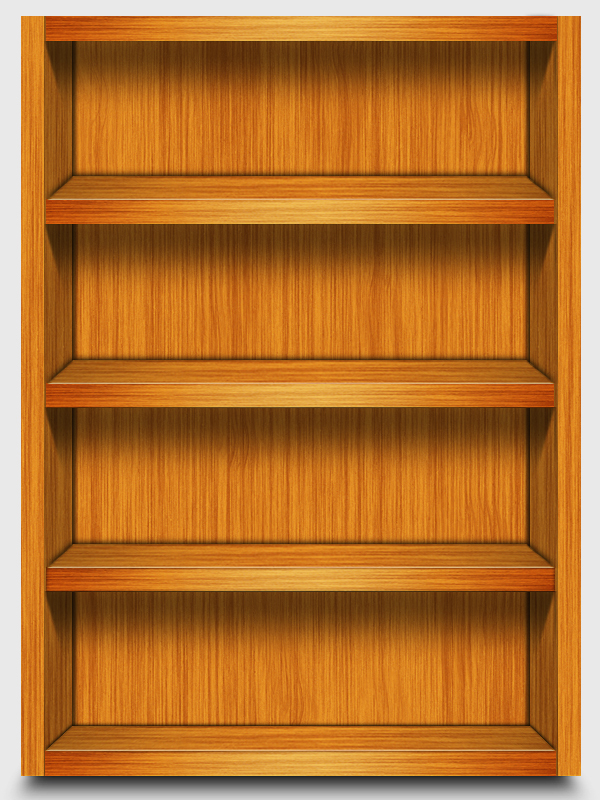 Virtual trophy cases are a great way to display your products, books, awards, and much more. Prominently showing off your firm’s (or your personal) achievements can quickly and concisely establish credibility without having to bore anyone with your resume, career history, or curriculum vitae. 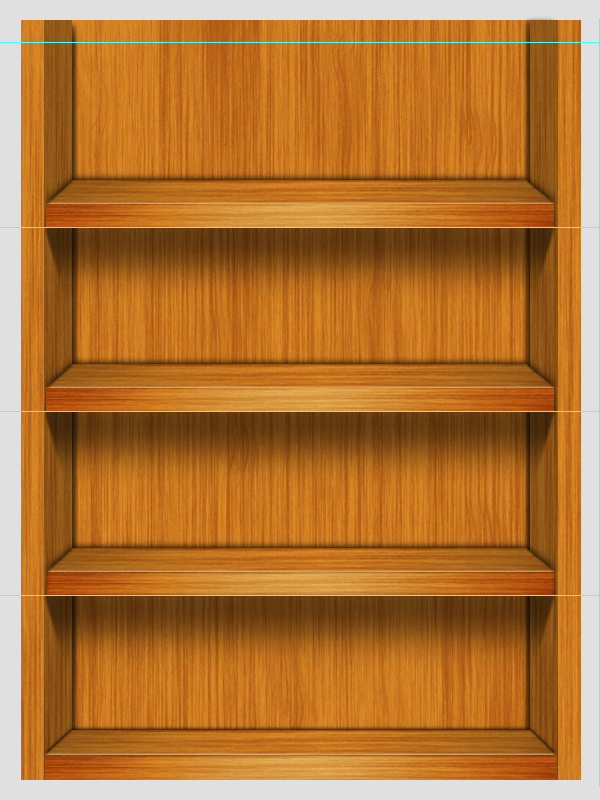 Today, I’ll guide you through the process of creating a wooden trophy case in Photoshop. 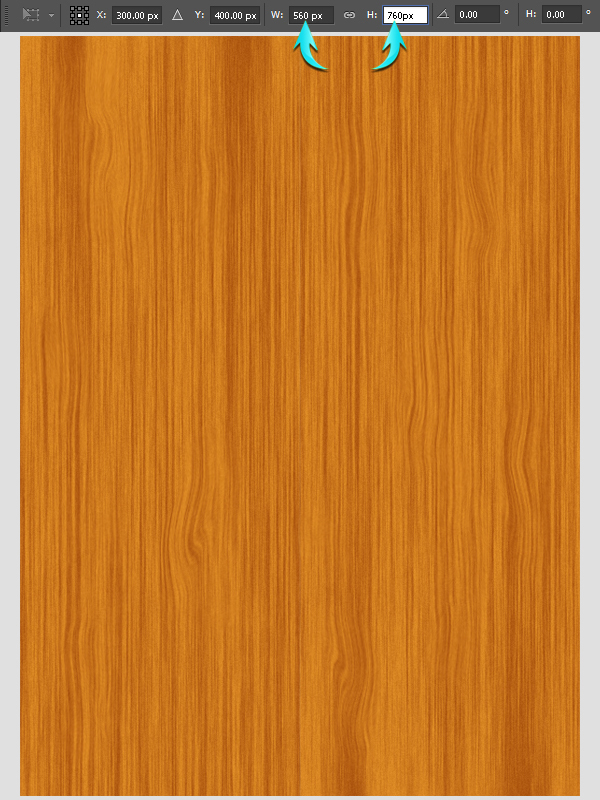 You’ll learn how to make an amazing wood texture and practice many handy techniques. So, let’s get started! 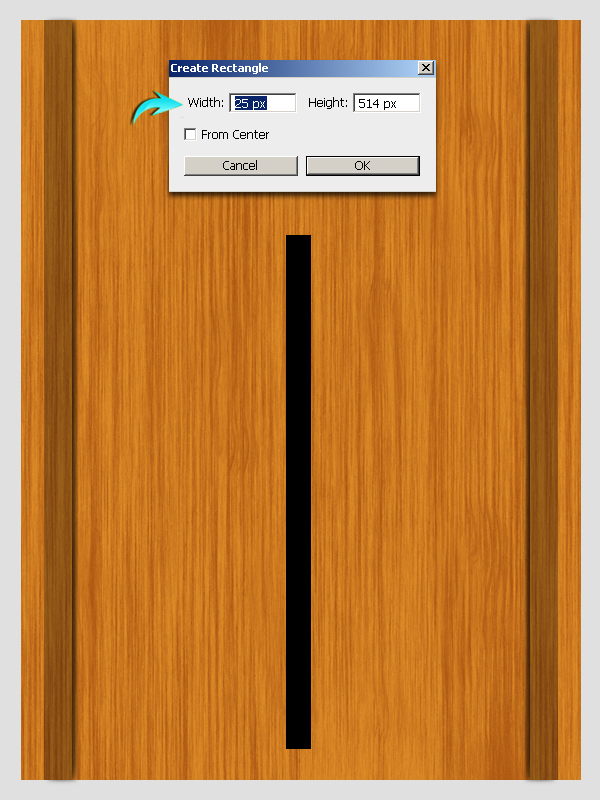 Create a new document in Photoshop with a 600px width and an 800px height. 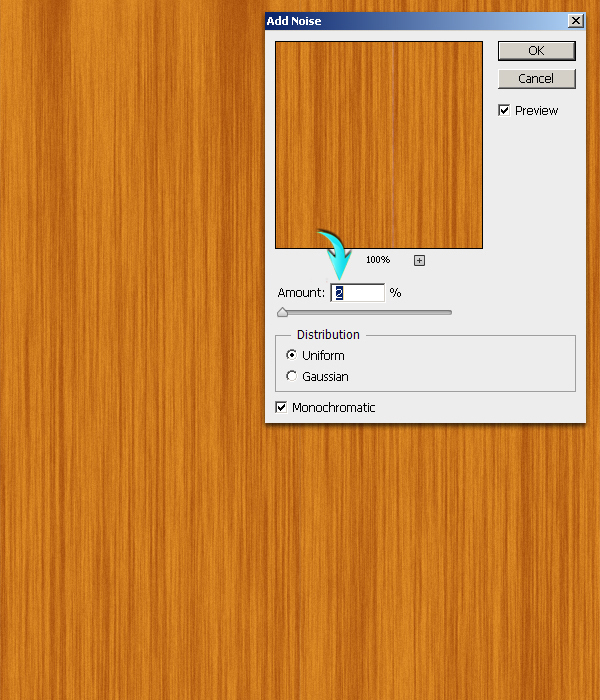 First of all, we’ll make a nice wood texture from scratch. Create a new layer by selecting “Layer” > “New Layer.” Fill it with any color using the paint bucket tool. Set #ab540f as your foreground and #dc8a24 as the background color. Now go to “Filter” > “Render” > “Fibers.” Use the following values. Now, press Ctrl + “T” to activate the free transform tool. 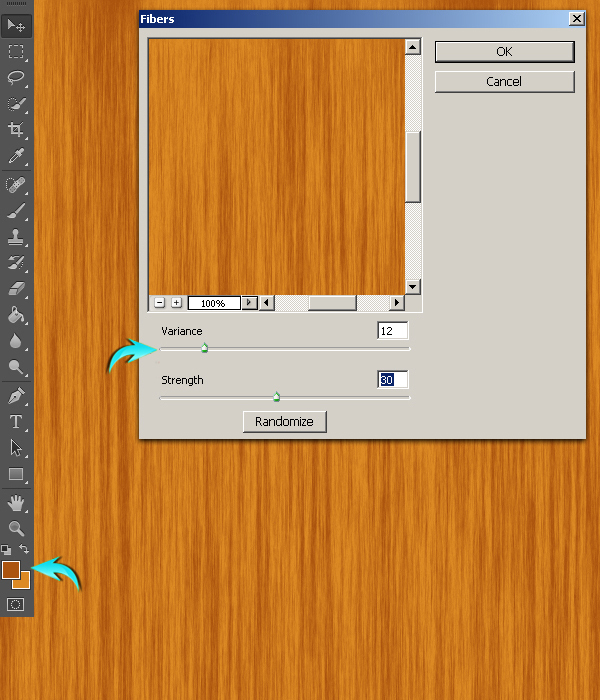 Put the value of 50% for the width in the top properties bar and drag the texture towards the left half of the canvas. 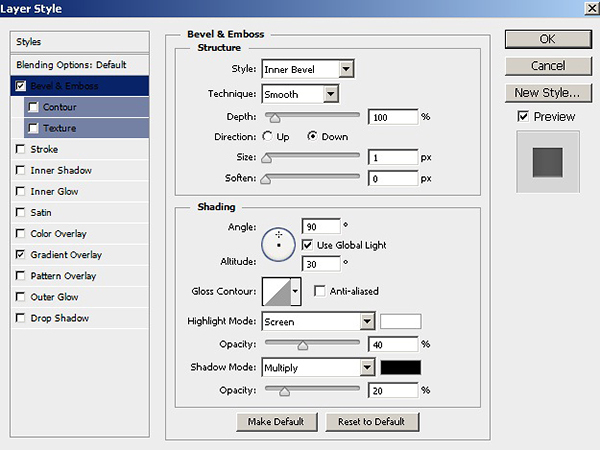 Next, to add noise to the texture, go to “Filter” > “Noise” > “Add Noise.” Use the following values here. 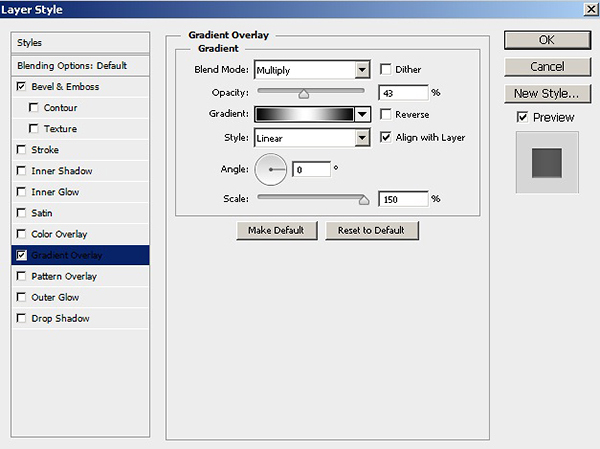 Now, go to “Filter” > “Liquify.” Use the forward warp tool with the settings shown below and apply it randomly at different spots over the texture. 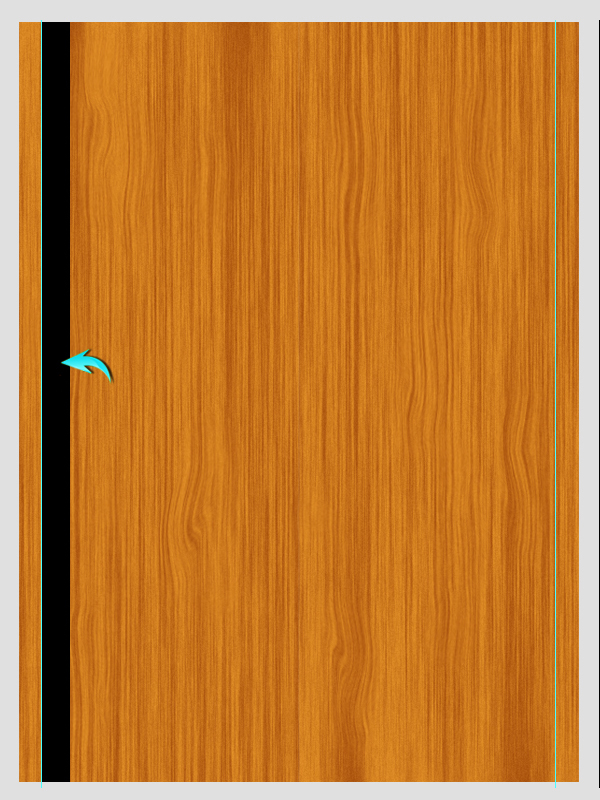 We are done with the wood texture. Now, resize it using the free transform tool (Ctrl+ “T”), and use the values of 560px for the width and 760px for the height. Next, we’ll make the shelf sides. 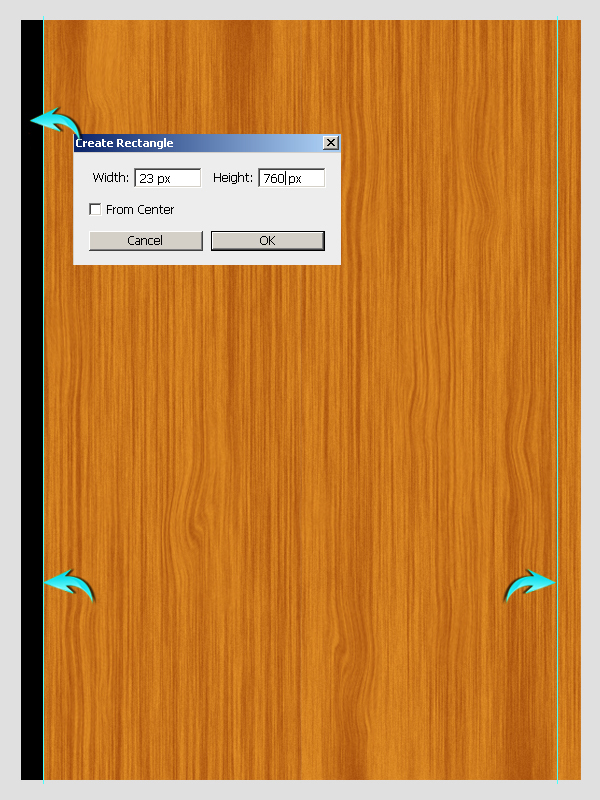 First, we have to position few guides for that, press Ctrl + “R” to make the rulers visible. 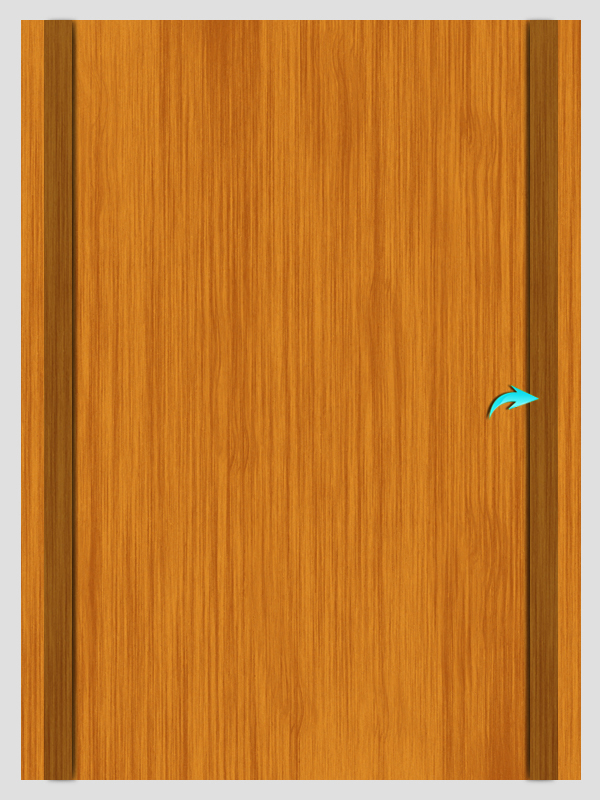 Select the rectangle tool to draw a rectangle like the one below. 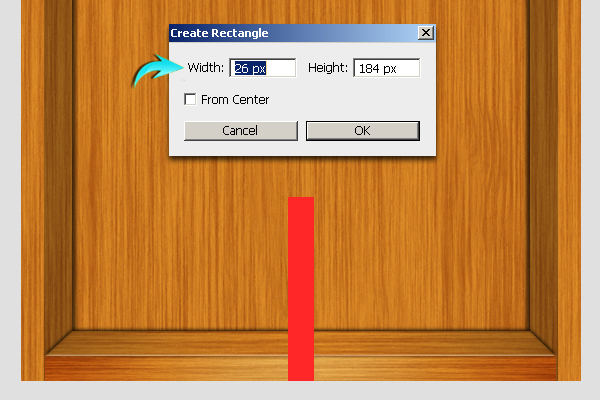 Place this rectangle over the left side of texture, drag a vertical guide, and position it beside the rectangle. 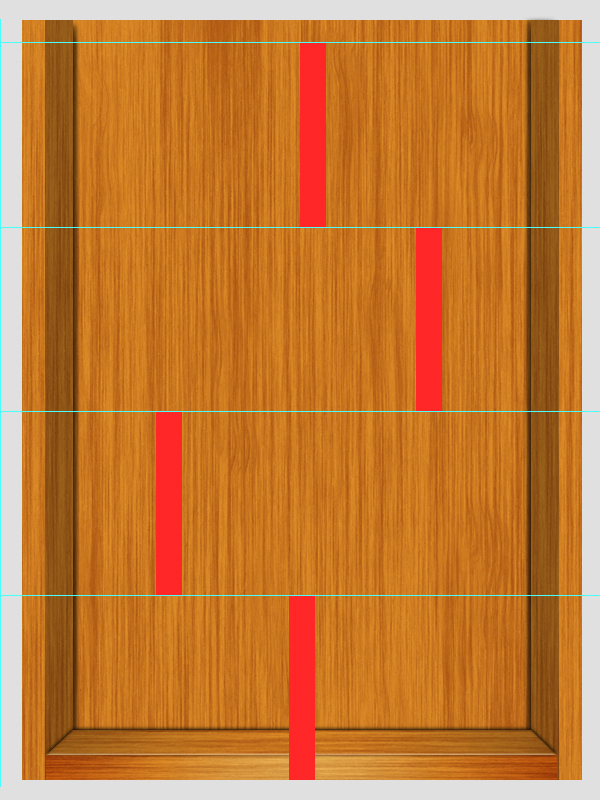 Now, take the rectangle to the right side of texture and place another guide along its border. Next, to make the inner part of the shelf side; place the rectangle along the inner side of the guide line. 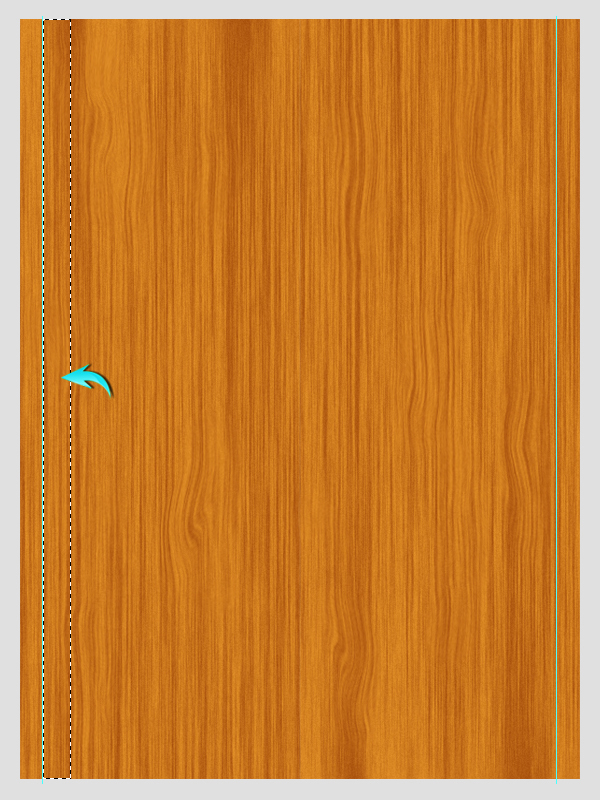 Now, slightly increase the width of the rectangle. Double-click on the “Left Border Inside” layer to open the layer style window and use the following settings for color overlay. Next, to form its shadow press Ctrl + <click on the “Left Border Inside” layer> to make a selection around it, create a new layer below, and fill the selection with pure black color. 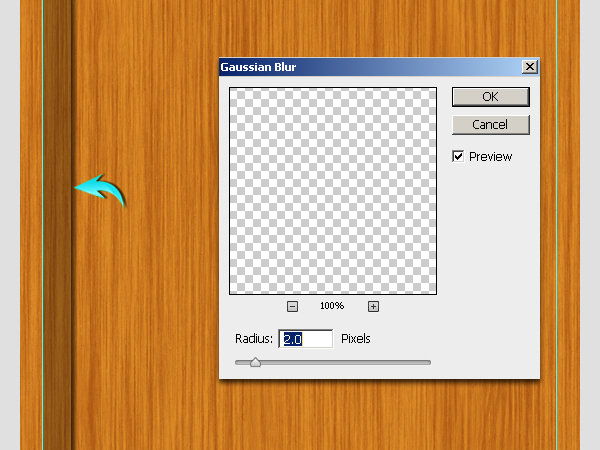 Now press Ctrl + “D” to deselect it and go to “Filter” > “Blur” > “Gaussian Blur.” Use a value of 2px here and drag this layer a bit outward to make it visible. Collect the “Left Border Inside” layer and its shadow in a single group, duplicate the group, and flip it horizontally. Position it inside the right sided guide to create the opposite shelf. Draw a rectangle as shown below. Now, press Ctrl + <click on the rectangle layer>. 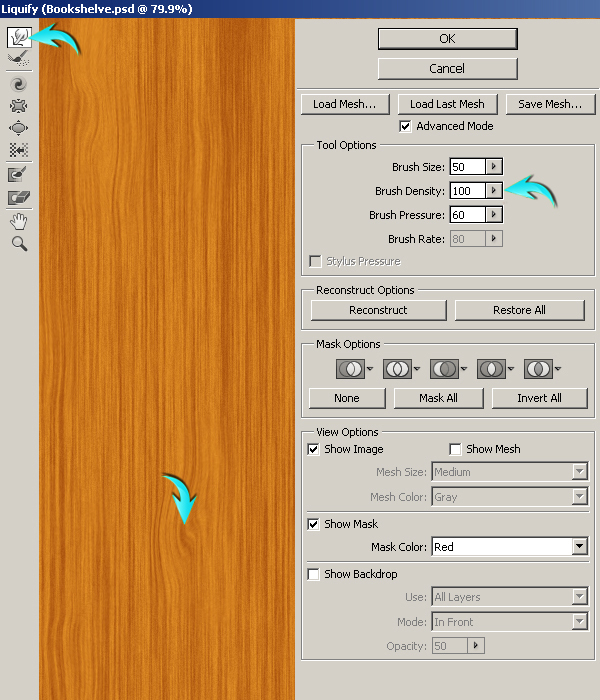 Now, click on the wooden texture, press Ctrl + “C” to copy, and press Ctrl + “V” to paste the selected texture onto a new layer. 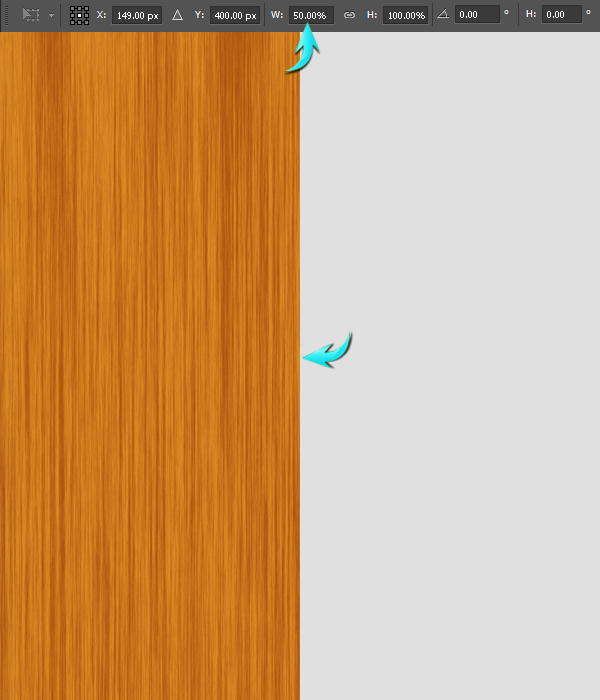 After that, go to “Edit” > “Transform” > “Rotate 90⁰CW.” Position it at the bottom of the texture as shown below. 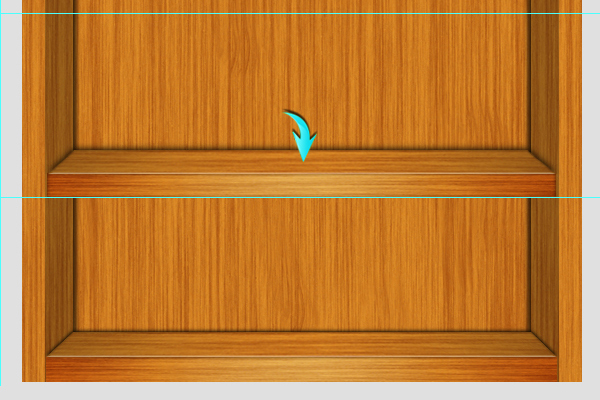 Label this layer as “Shelf front.” Then, hide or delete the rectangle. 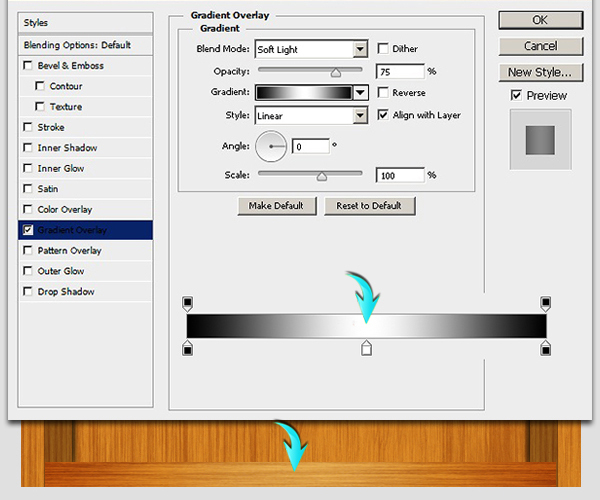 Apply the following gradient overlay settings on the “Shelf front” layer. 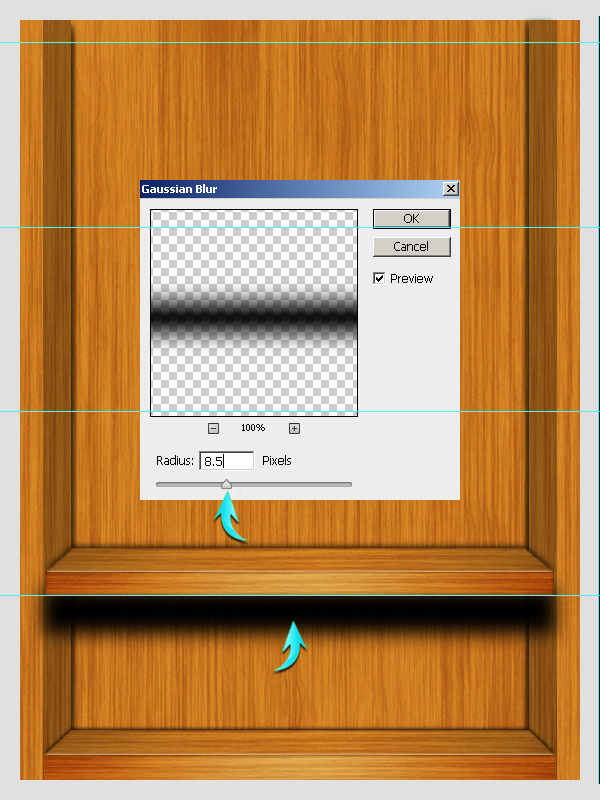 Duplicate the “Shelf front” layer, label it as “Shelf top,” position it at the top of the original layer, and go to “Edit” > “Transform” > “Distort.” Use this tool to bring its corner inside as shown below. 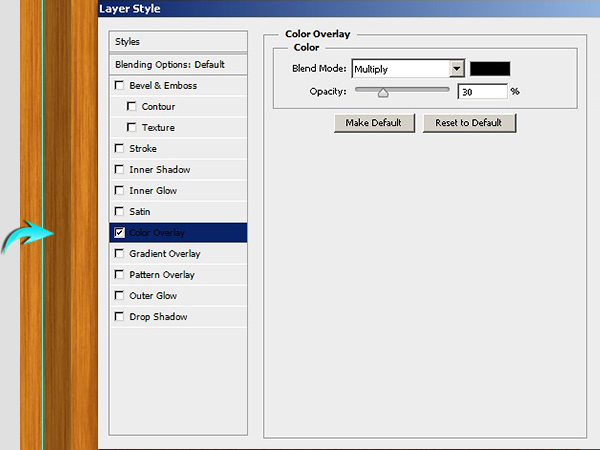 Apply the following layer style settings on the “Shelf top” layer. 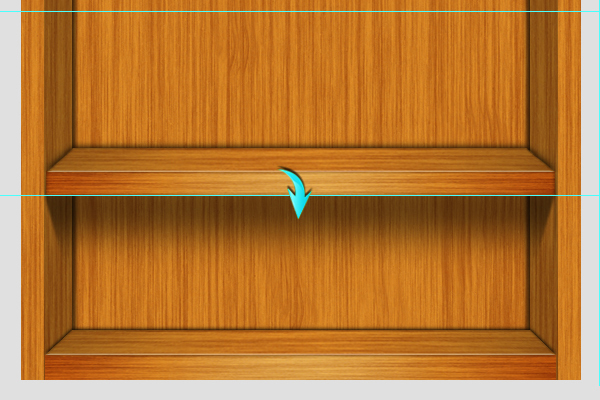 Make the shadow of “Shelf top” layer in the same way as explained in step 10. 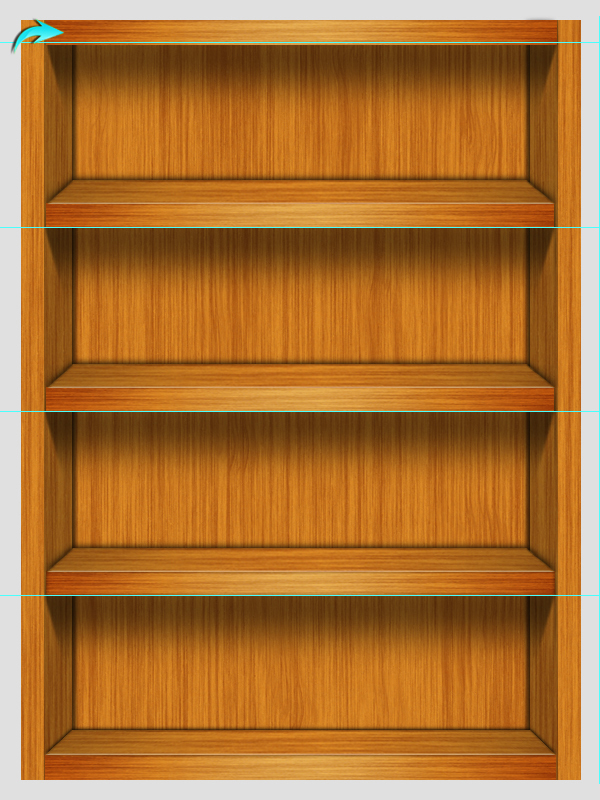 Now, we’ll use some more guides to define the position of middle shelves. Draw a rectangle as shown below. 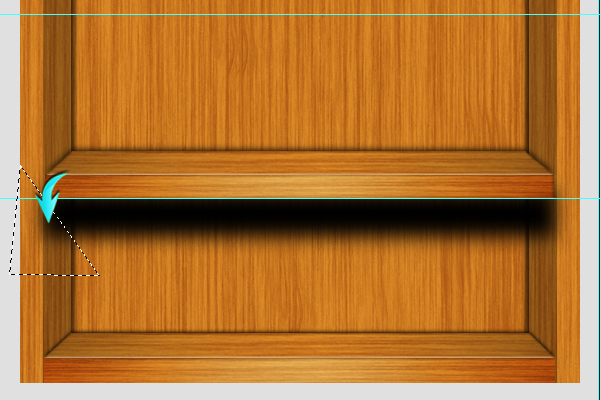 Drag the guides to form even horizontal shelves, as shown below. 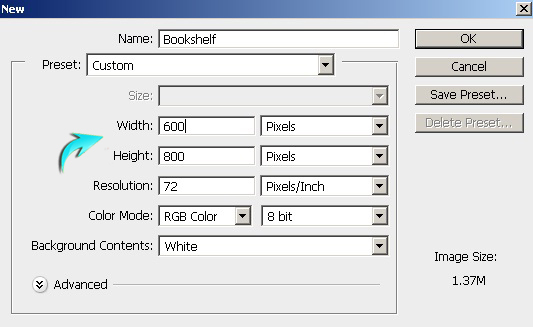 Duplicate the “Bottom shelf” layer and position it as shown below. To make its shadow, draw a rectangle as below and apply a 7px Gaussian Blur filter. Now, use the polygonal lasso tool to select a triangular area on the shadow layer. After that, go to “Edit” > “Clear.” Do the same for the right side of shadow and reduce the opacity of the shadow layer to 50%. Label this group as “Middle shelf,” duplicate it few times, and position the shelves as shown below over each horizontal guide. To make the top border, place a copy of middle shelf over the top guide and erase the shelf top layer, including its shadow, from this group. Our wooden trophy case is almost ready. You can make its shadow using the same techniques used to create the middle shelf shadow. However, make a thinner rectangle this time. 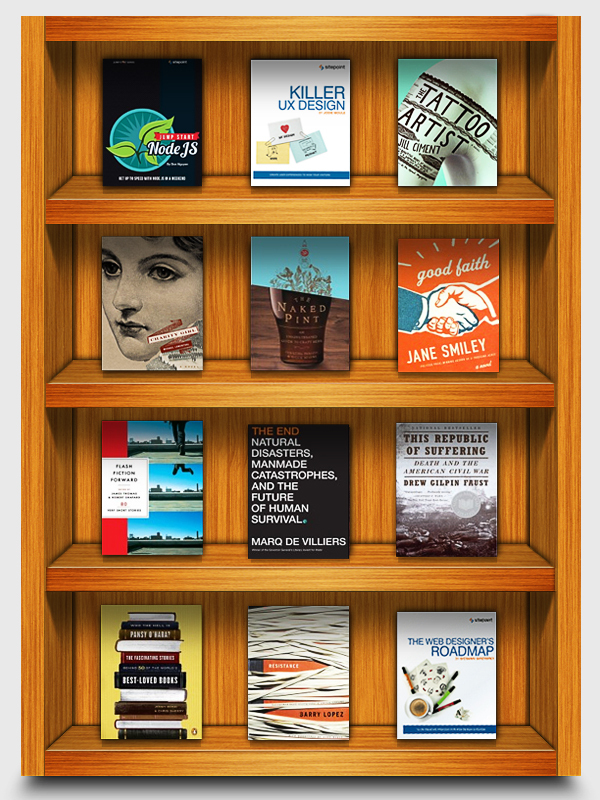 Here is how it looks after displaying books. That’s it. I hope you guys enjoyed the tutorial and learned something new. Do share your thoughts!